All those piles of hardbacks gathering dust on your shelves can finally be put to good use! We’re not saying this incredible artwork can be done by just anyone, but what an original and beautiful way to turn an old book into a delicate and breathtaking work of art. 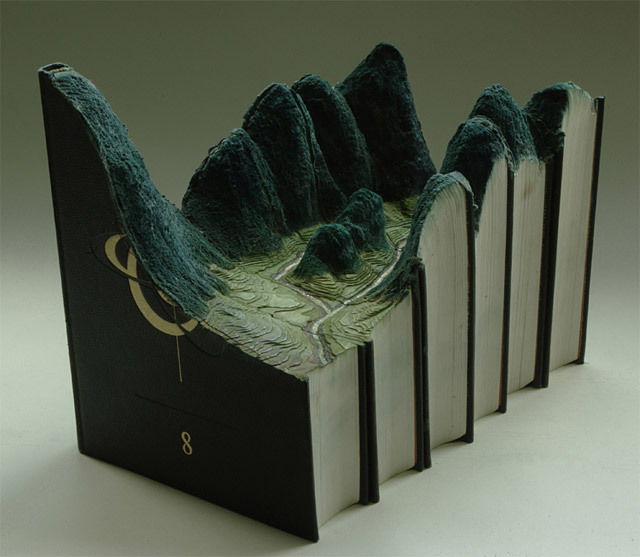 Artist extraordinaire Guy Laramee transforms these books into mountain ranges, volcanoes and even a pool of water. This August he will be displaying his creations in the Expression Gallery in Saint-Hyacinth near Quebec, and we only wish we could drop by and see it ourselves. Amazing!